These figures indicate a preference for the noble order Coniferae, of which Mr. Smith possesses one of the finest collections anywhere to be seen. The department devoted to grafting and otherwise increasing rare Conifers here is most interesting, grafting being the only mode of multiplying some scarce kinds, of which it has been impossible to obtain seeds either on account of the difficulty of procuring them or because the kind may have happened to have been a natural sport differing widely from its parent, yet so unfixed in its variation that its seed (if procurable) would have returned to the normal type. Indeed, the difficulty of obtaining seeds of rare Conifers is more frequent than is generally imagined, and in these days of telegrams and high pressure speed as applied even to horticulture, it does not do to be behind the age; therefore, in order to overcome the difficulty, invention has been taxed to select for stocks the closest allied kinds of Conifer to those it is desired to graft upon them; and to an accurate observer it is surprising how soon a suitable stock is seized upon, potted, established, and then carefully grafted at the right season. Afterwards it is watched and tended daily for a few weeks in a close Warden case, when a thriving young specimen of the desired kind, satisfactory in every respect, is the result. There is frequently another provoking trial to cultivators, which is this: A new and peculiar variety has to be multiplied, possessing, as usual, one leader only, and yet the plant must not he destroyed. In that case, recourse must be had to the side branches, say those of a Spruce Fir which spread out flat, like the pinnate on a Fern leaf, rather than radiating from the upright stem like the spokes of a wheel. A cutting or graft of this kind, when put upright, will be flat instead of round, an anomaly that can only be rectified by means of patience and high cultivation. When the young plant is in luxuriant health, it must be cut down, when it will be almost sure to throw up one or more leading shoots or fleches, as the French term them; and these leaders, if grafted on suitable stocks, are no more to he objected to than Greengages grafted on wildings, or Golden Pippins on Crabs. One never hears any one object to a Peach, Nectarine, or Apricot being budded on a Plum stock, and in that case the dissimilarity between graft and stock is vastly greater than that between Conifers and the stocks on which they are grafted. Of late, increased attention has been paid to Ivies, arid the so-called Tree Ivy, which has a bush-like form, is becoming a great favourite. It is, indeed, one of the most ornamental and beautiful of evergreens, its fine foliage and bushy habit being particularly pleasing during the winter months when so many trees are uninteresting and leafless There are twelve or more varieties of this kind of Ivy, some of which are variegated. It has been proved that cuttings taken from Ivy, which has assumed the tree form (as climbing Ivies do at an advanced age), and grafted on the common Irish Ivy, at once take the tree form without having to pass through the climbing state. To show how popular tree Ivies have become, we may mention that some thing like ten thousand plants of them are grafted in these nurseries every year. Perhaps no tree or shrub succeeds better in towns or smoky districts than Ivy, and for such places tree Iris are invaluable, and, indeed, every arboretum or garden that does not already possess such plants should be enriched with a collection of them. In addition to these, Mr. Smith grows large numbers of climbing Ivies, including most of the varieties in cultivation, many of which are of a very striking character. Here the eye and palate are great rivals, for one hardly knows which receive most favourable attention, Roses or fruits; undoubtedly the latter form quite a specialise for the many thousands of trees one sees in walking round are perfectly astonishing. One wonders where they all go. Fancy 60,000 trees, all trained for walls or espaliers, ready for one season's sale! Why, at four yards apart, they would plant a length of eight miles and a half! Then there are besides immense numbers of standards, dwarfs, pyramids, and other forms of tree required for gardens, orchards, or houses. The quality and symmetry of Mr. Smith's fruit trees must be well known throughout the country, for there is not a county in the United Kingdom into which there have not been introduced large supplies, and that they give universal satisfaction is proved by the largely increasing business. Perfection in cultivation is not easily attainable, but it is evidently striven after here. Half a million stakes are annually used in forming the trees, and no pains appear to be spared. Correctness of name is of primary consideration; for what is so annoying, after waiting for a fruit tree to bear, as to find that you have been deceived in the sort? The greatest care was given years ago to collect the sorts direct from their original sources where possible, and, in default of that, from the most reliable authority; and when doubt arose, proof was obtained by fruiting the kind in an orchard house. Stock plants of every particular variety are kept, and the most scrupulous attention is paid to the naming of the various sorts: During the time of budding and grafting, the greatest possible care is used to avoid confusion, and as from twenty-five to thirty men are employed at this work, it is not to be wondered at if an occasional error does occur; but in order to meet such an occurrence, the fruit foreman carefully examines every row when the trees are coming into leaf, when in full leaf, and again at the fall of the leaf, so that his practised eye inevitably detects an error should one have occurred, and the tree is at once destroyed. Before walking round, Mr. Smith begged us carefully to try if we could find one blighted tree or one that appeared untrue, judging by others in the same row; it is only fair to say we did not observe one incorrect or diseased in all the stock. Of course aphides will occasionally attack almost every kind of plant, but they do not by choice feed on healthy trees; they no sooner make their appearance here than the trees are well washed with soft soap and water (the most effectual and speedy remedy) until there is no sign of a living insect; during the blight season some trustworthy men are always on the look-out for these pests, so that they have no possible chance of containing their ravages for any length of time. To give an idea of the importance attached to Roses, it is worthy of remark that 60,000 are yearly grown in pots under glass; 500,000 Rose cuttings for stock were put in last autumn, and there is a square of five acres and a half, planted out entirely with Rose stocks for next summer's budding. Ten acres in the open air are devoted to Roses. The collection of Oaks gathered together here is one of the most beautiful ever made, and besides the flowering and ornamental-foliaged shrubs, in which this nursery is very rich, there are forest trees, hedge plants, creepers, herbaceous plants, Etc; all cultivated with the greatest care, frequently transplanted to render them safe for removal, and each plant from its earliest growth formed e to make a handsome specimen. Thus, by early and constant care, the most perfect shape that can be desired is obtained without stiffness or formality. For years past the object has been to collect and multiply all the good varieties that could be obtained, and he must be difficult to please who cannot be satisfied in such a choice collection. We were particularly struck by the cleanliness of the nursery. There was almost a total absence of weeds. Much attention is paid to this, so that every plant maybe free and healthy in growth, for, where weeds prevail, stock must suffer more or less. 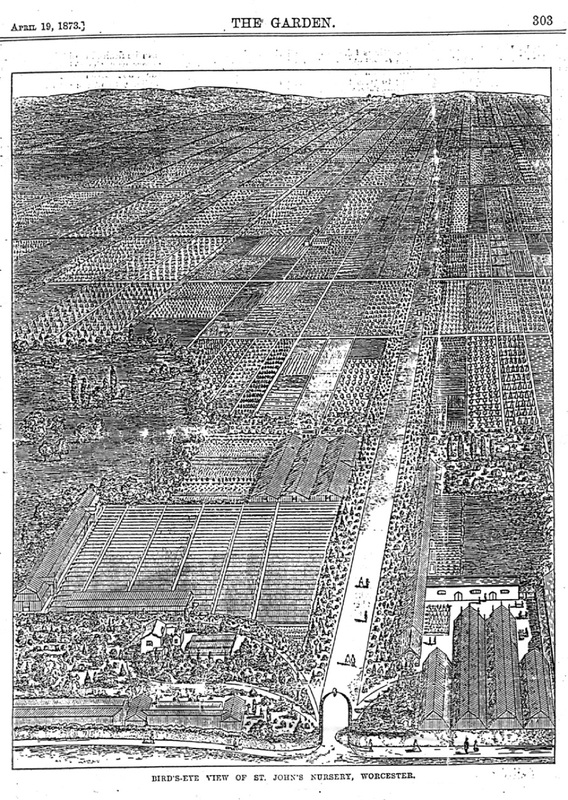 For the rearing and cultivation of stock there are two acres and a half of glass, composed of 1,750 pit-lights and twenty-four houses, from whence several millions of plants are produced annually, requiring 150 teas of garden pots and 100,000 wooden labels every year The nurseries occupy upwards of 150 acres of fully-cropped ground The principal drive, going straight through the nursery, is one mile long. This is crossed by another seven-eighths of a mile long. There are thirty-two miles of walks, though no more than are necessary to attend properly to the stock. 250,000 Rhododendrons, Conifers, and other evergreens, flowering shrubs, Clematis, etc; are annually grafted under glass. The packing is carried on in four large sheds, the largest I45 feet long by 10 feet wide, to which a crane is attached for lifting heavy packages into the railway waggons, which call daily. To give an idea of the extent of this department, it is sufficient to mention that, from the commencement of October to the end of the year, from eighty to one hundred men are constantly engaged in executing orders, and the following material is required for one season's supply:- 100 tons of straw for packing 350 bundles of willow bands (each 3 feet round), 5,000 bast mats, 1.5 ton string; £200 worth of baskets, £100 worth of crates, and 80,000 parchment labels. Of the Weeping Beech - to the picturesque appearance exhibited by which we have on several occasions alluded - Mr. Smith has a beautiful specimen, which we have thought worthy of separate illustration (see p.299). This fine tree is upwards of 25 feet in height, and has a stem some 6 feet in circumference at the base. The spread of its branches varies from 35 to 40 feet in diameter. It was struck by lightning during the summer of 1857, but instead of being riven to pieces, like the generality of lightning-struck trees, the electric fluid only seared some of the main branches, and the health of the tree has in no way suffered from the shock. As will be seen, it is a grand example of this variety of Beech.